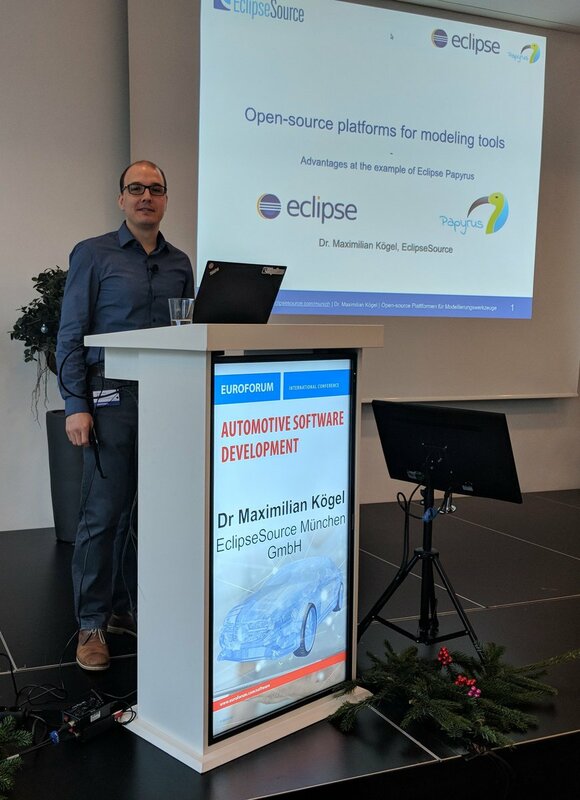 Yesterday, my minion Maximilian went to the Automotive Software Development Conference (Euroforum) and presented me and my Industry Consortium! I hope I made a good impression (I’m sure Maximilian did a great job)! Maybe one day, you will be driving a car with software designed with my help! AMASS uses me for Systems Modeling! If you work with Cyber-Physical Systems (CPS) and do not know about AMASS, I invite you to have a look at their objectives. This is another great example of the strength of the Papyrus solution, especially when mixed with other Eclipse and PolarSys solutions! Why we need industrial consortiums for open source projects! Industrial usage of open source solutions – Why do we need industrial consortiums? Ericsson’s Francis Bordeleau, who is also the Me-IC’s chairperson will be presenting this very interesting topic. I must say that, as an open source project myself, I have profited from the creation of the Papyrus IC and I certainly owe some of my growth to its members! If you are curious as to how open source project can grow and become more palatable for usage in an industrial setting, then you must attend this webinar! You can find information on how to connect from the Me-IC Research and Academia webinar page!